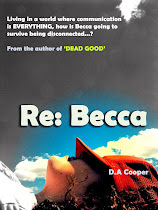 Debs Riccio: Possibly the weirdest premise and synopsis I've ever read... I can't wait to read the book! Possibly the weirdest premise and synopsis I've ever read... I can't wait to read the book! I love it when I get an e-mail update from the lovereading.co.uk people. It's great to see what new books are around or are about to come out. And I *heart* it even more that there're always tons of extracts you can have a read of before buying (from Amazon, more cheaply in my case - but you didn't hear me say that) and I've just read the first few chapters of 'Bad Karma' by David Safier - which is witty, sparkling, clever, a touch crazy and I'm dying to read on ... definitely on my list of 'To Get's when it's released. This debut novel by David Safier follows the trials and tribulations of Kim Karlsen, a television personality whose career obsession brings her some serious cosmic repercussions. In her quest to dominate the airwaves, Kim cheats on her husband, neglects her daughter, and mistreats her staff. It all seems worth it when she wins the biggest German Television Award, but sadly on the very same night she is crushed to death by debris falling from a Russian space station. At the gates of Heaven, she is informed that she has collected too much bad karma in her life, and has a long road of atonement ahead. Reincarnation as an ant teaches her a few lessons in humility, and she experiences existence as a guinea pig and as a beagle before regaining human form just in time to sabotage the marriage of her husband to her back-stabbing best friend. Well? What're you waiting for? Get on over there and have a read yourself - you'll thank me for it! Wow! I see what you mean about the weird premise. I must go check it out! Sort of like Douglas Adams meets Sophie Kinsella - type thing, d'you think? The chapters ARE very good. I cannot wait! Have you read the chapters, Lane? It's very compelling stuff.